The AI-infused MediaTek Helio P60 chip made its official debut at MWC 2018 today, when there is an interesting dynamic happening in smartphones: the iPhone X and Samsung Galaxy S9 are pushing prices up, while mid-range phones are catching up in power, yet staying at the same low price. This is creating a whole new genre of smartphones in 2018, what MediaTek likes to call 'New Premium' – handsets that offer higher-end performance and features at mid-range prices. In other words, our best cheap phones list could change dramatically in the coming months. Here's everything we know about the upcoming Helio P60 chip from MediaTek. 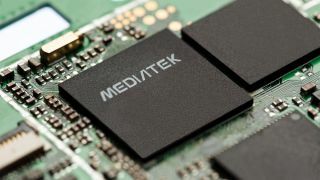 New is the fact that the MediaTek Helio P60 chip has eight cores and AI built into the chipset, according to the Taiwanese chip manufacturer. It's trying to compete with the likes of Qualcomm by offering an octa-core big.LITTLE configuration on a 12nm chip, but doing so for mid-range priced phones. This powers a 70% CPU and 70% GPU performance uptick compared to its chipset predecessors, the Helio P23 and Helio P30. In addition to the eight-core processor, it makes use of the new Mali G72 MP3 GPU at up to 800MHz to help raise the graphics performance bar. And while it's not MediaTek's most powerful chip, Helio X30, the Helio P60 chip is priced for mid-range phones that will move big numbers. We've heard from smartphones manufacturers over the years who have quietly told us that while they tout flagship handsets as their star products, it's their budget phones that see the most sales. The P60 is designed to become the future of these mid-range phones. In addition to 70% performance gains, Helio P60 is promising 12% efficiency overall and to become up to 25% more efficient in situations when you're running intense tasks (think 3D gaming), according to MediaTek. The result here is that your new phone won't run out of battery quite so fast. The chip's CorePilottechnology is supposed to assign workloads across the eight cores for optimal performance. Helio P60 also has three different ISPs for its camera, which allow it to see an 18% power savings on dual cameras vs previous generation chipsets. You should walk away with more photos before having to recharge your device. All of this helps solve the No. 1 complaint we hear from smartphone users everyday. It's not the camera, screen resolution, or thinness of the phone they want to maximize. It's that they want more battery life. AI is the new buzzword that every phone and chip maker is capitalizing on right now, and the Helio P60 is right there in the thick of this trending technology initiative. MediaTek's NeuroPilot AI architecture brings features like facial recognition, object and scene identification to the chipset, and it's compatible with Google's Android Neural Network with support for TensorFlow, TF Lite, Caffe and Caffe 2. What this means for the average consumer is that developers will be able to bring AI applications to smartphones with the Helio P60 chip. Mid-range phones should be able to become part of that AI future that everyone is talking up, too. Phone manufacturers can also harness new camera capabilities thanks to the fact that the new chipset supports a 20MP and 16MP dual camera, or a whopping 32MP single camera system. We may not actually see a 32MP camera from most mid-range phones, but it's the new ceiling on the P60. This is also how MediaTek is able to boast camera tricks like real-time bokeh, anti-bloom, noise reduction and AI-accelerated face. The Helio P60 shows promise for smartphones aimed at price conscious buyers, but it's going to take phone manufacturers to implement the new chip in devices first. Right now, there aren't any official phones announced that include the Helio P60. However, MediaTek has worked with Lenovo, Xiaomi, Meizu, Oppo and other big industry names in the past and it counts them as its 'New Premium' partners. As MWC 2018 wraps up and more shows like Computex 2018 (in MediaTek's home country) roll around, we'll continue to detail the Helio P60 and its performance gains for mid-range phones.